Viewed these helmets at the Manchester bike show and purchased from SBS. Looks superb, tailored fit with the cheek pad inflation system and an inbuilt sun visor. Highly recommended and at a great price point. Fantastic looking helmet,lightest I've had and snuggest fit. Has a pump feature to make sure you get it completely fitting but I didn't need it. This product is absolutely amazing! Looks great and it's very light compering with other helmets. Sizing was perfect had no problems at all. Another great thing is that there is a free space left for the speakers inside the helmet, up to 14mm and works perfectly with SENA products. Very happy with the purchase! Top quality product! First class bit of kit. I ordered a Scorpion Exo 1400 air carbon pure yellow from SBS and received it five days later in Southern Spain, post free. What a service from SBS. The helmet fits perfectly and is extremely comfy to wear. The wide view visor is excellent and the air pump system really does help keep noise down. The double D fastening strap is very comfy to use and the light weight of the helmet together with the aerodynamic shape help make it the most comfy helmet I have owned. The helmet came with clear and smoked visors together with pinlock antimist and internal dark sun visor. Air venting is good with no misting and no overheating internally. The internal sun visor was damaged when I received the helmet, but I Was Immediatelly sent a replacement from SBS. All in all I am extremely happy to recommend the Scorpion Exo 1400 air carbon and buying from SBS. 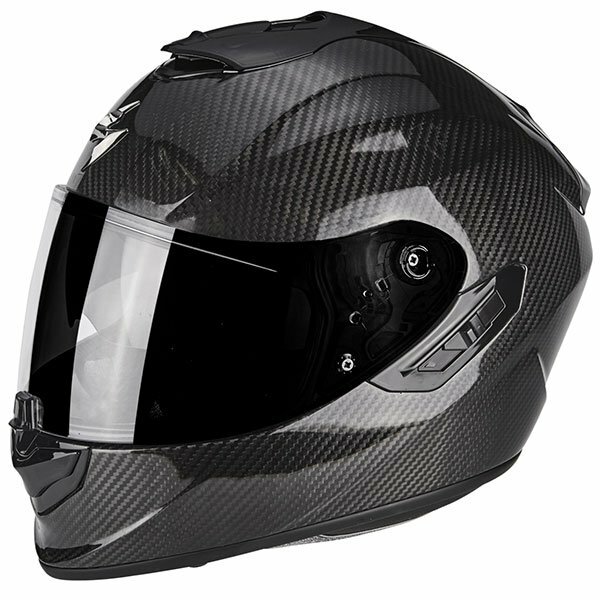 Super light (1200gms) carbon helmet with a great finish that's extremely comfy and so much quieter than my past Shoei's. Integral sun visor is optically clear and just the right tint, it actually improves contrast. Perfect fit, no pressure points and I can get my specs on. Supplied with a clear & dark visor, pinlock and a quality bag. Ventilation seems adequate. Well the finish of helmet is excellent ,I received an defective helmet , the internal sunvisor mechanism was damaged on arrival. Apart from that rest of the helmet is pretty nice and accurate fitting . 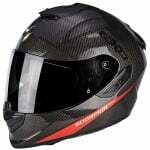 I have had several full face helmets of different brands most recent being AGV K5 and HJC FG-ST, my size in the Hjc is M58 so ordered the M57-58 Scorpion and it fits like a glove, sizing is true for me and its so light, the visor mechanism works great and the inflatable bladder pumps and deflates perfectly, the chin strap feels more comfortable than the Hjc too, it came with a clear visor fitted and also came with a tinted spare and pinlock in the box, the helmet bag is better than any other too but that just gets left in the draw, oh and the internal tinted visor works great too, i cant recommend this helmet enough, just get one and see, Thanks Sportsbikeshop. This helmet is lighter, quieter, and more comfortable than my other one. I couldn't be happier. Got this for my misses as a Christmas gift & as soon as she opened the box she was over the moon. Really happy with his helmet , I'm a motorcycle instructor and ride every day. This lid is comfortable, light and has excellent visor and internal visor, ideal for everyday use. Initial impressions are very good. Helmet is light and seems to be very good quality. A bit tight to get on and off but once on it fits well. Sizing seems accurate, I normally wear a large and that's what I bought. Cant comment on noise as weather is not good. Dark visor and Pinlock included in the box together with a nice bag. Really smart looking helmet. Extremely good quality, right down to the helmet bag it comes in. Inside material is very nice against the face. Sadly it didn't quite fit around the crown due to it just not being right for my head shape. Wish it had have fitted though!